Why should you choose Caribbean Pools? 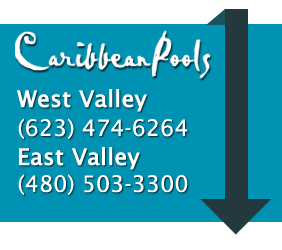 Caribbean Pools has been designing and building swimming pools, spas, and waterfalls in AZ for 20 years, building a name for quality products, friendly customer service, and competitive pricing. When you contact us for your new pool construction or pool renovation needs, you can expect expert service, along with the most experienced technicians in the pool construction field, to be with you every step of the way from your free in-home assessment all the way through to the completion of your project. We utilize only the highest quality parts and equipment, giving you the assurance that your new pool construction will be built to last. Caribbean Pools has an excellent rating with the BBB! You can rest assured we will work with honesty and with integrity to help you create your dream pool construction.